I've already reviewed the larger Triton TR001 3¼HP router here - this review is of the new Triton MOF001 1400W 2¼HP machine, with some direct comparisons with the larger model where appropriate. 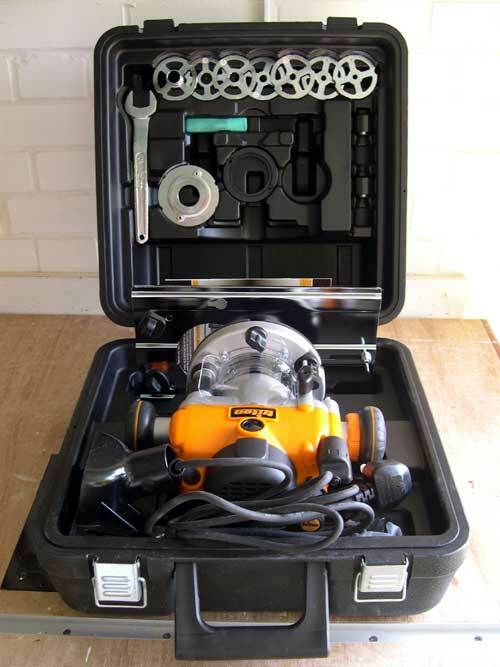 The tool comes in its own moulded carry-case, with toggle clasp fastenings. Upon opening the case, I was pleasantly surprised to see how neatly laid out the contents were, as can be seen from this picture. Here are the two machines side-by-side for size comparison. The larger machine weighs in at 6Kg (13.2 lbs. ), whereas the new router weighs 1.3Kg (2.8 lbs.) less, at 4.7Kg (10.4 lbs.). The "back" view completes the comparison picture and some detail differences can be seen. The depth stop, locking knob and three-position adjustable turret are on the back of the new router instead of the front. The variable speed thumbwheel turns in a vertical plane rather than horizontally - more difficult to see the numbers when inverted. The micro-adjuster, spring release cap and power switch are identically placed, although the power cable exits the top of the machine at an angle, rather than vertically. This is much better for hand-held working. The dust port is now on the front left-hand side, instead of the rear right-hand side. This view from below shows the smaller base of the new machine. The mounting screws and extended baseplate knobs are in the same locations, but nearer the edge due to the smaller overall base diameter. The baseplate screws are pleasantly robust! 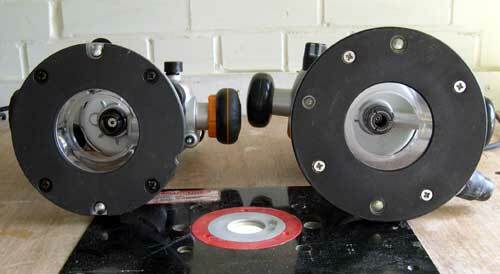 This picture shows the extension to the micro-adjuster on the rear right-hand side. Note the "T"-bar, which is for the above-table winder to engage with. This shows the scallop in the base of the machine, necessary to accommodate the above-table winding handle. Note the much thicker standard baseplate (see post). Here is the above-table height-adjusting mechanism in position. 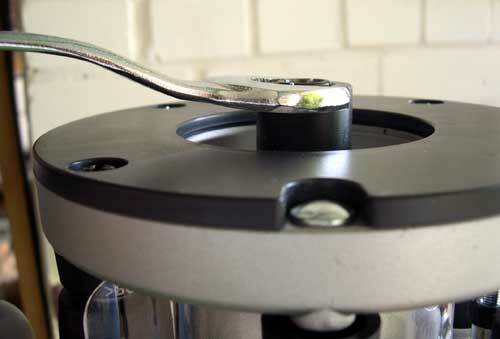 Each calibration mark on the disc below the handle represents 0.2mm (1/128") cut depth increment. A full 360° turn changes the cutter height by 2mm (3/32"). 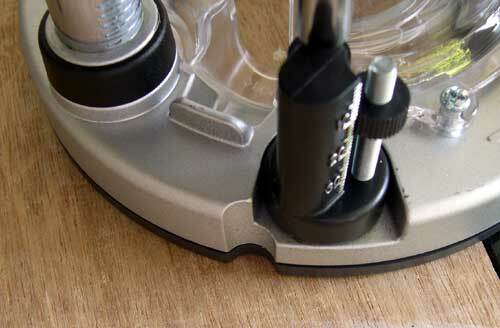 I have not yet drilled my table inserts in order to use the winding handle, although I will do so in the near future. For this reason, the handle could not be shown in situ. Included in the kit are six screws. From the left, the two bright screws (M4) are for the template mounting system, the two 1" and two 5/8" screws are for use with the chip collector (with the standard or extended baseplates). The extreme right-hand screw is one of the standard baseplate screws, for comparison. The chip collector can be fitted to either the standard or the extended baseplate, using the supplied screws. In this picture, viewed from below, the port is fitted over the standard baseplate, by replacing two of the baseplate screws with two 5/8" screws. 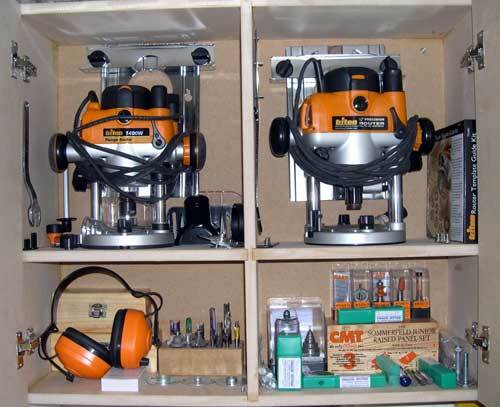 This picture gives an impression of the usefulness of this collection port when used with a bearing-guided bit, such as a profiler. 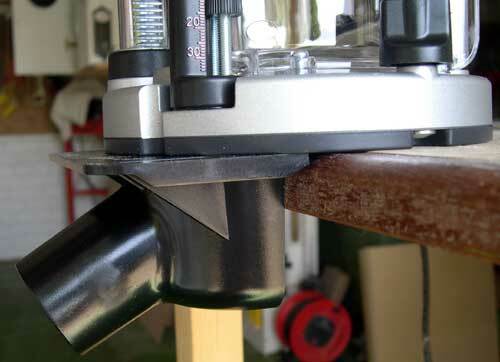 I tried it with the Leigh™ D4 jig, but when fitted, the left-hand side of the port just fouls the template slide arm. It's great for edge-profiling, though, or anything else where there are no lateral restrictions. 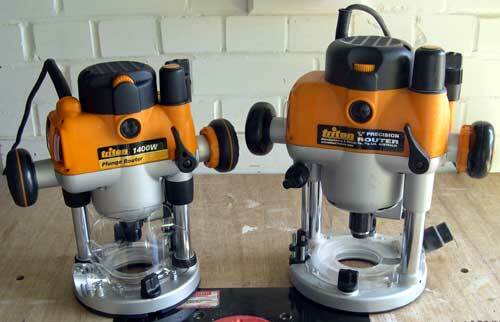 The collets are a complete change from the "Hitachi"-style, as fitted to the larger machine. These are the self-releasing type, which require an extra half-turn to release the bit. A bottom view of the collets. The substantial, cranked (24mm) collet wrench. 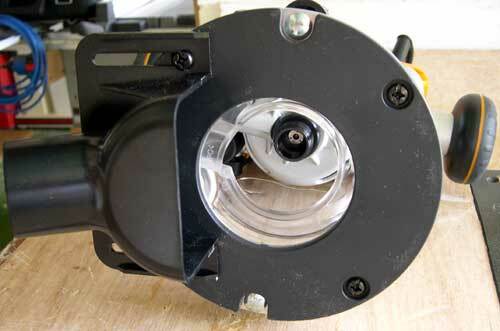 A welcome improvement has been made to the plunge selector mechanism. 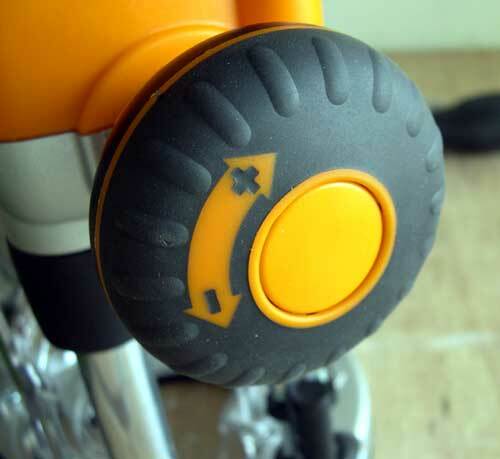 Instead of the "push and turn" recessed section in the right-hand handle, there is now a simple push-button, shown here. 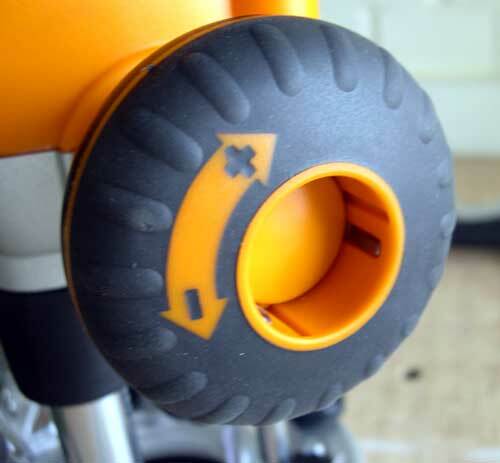 This view shows the button fully depressed, providing free plunging action. Another push of the button causes it to spring out and return to the "rack and pinion" mode. 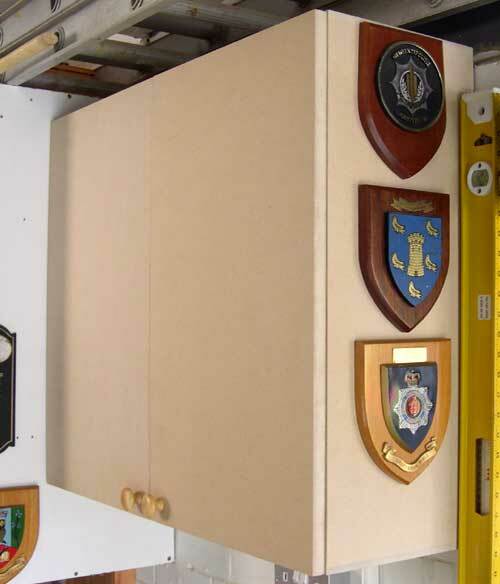 As I was now getting a bit cramped for space in my existing cupboard, I knocked a new cupboard together from MDF off-cuts and hung it off a French cleat. Now I've got both machines, plus the bits I most frequently use with them, all together in one tidy place - much better! In use, the MOF001 is a delight. It is quiet, easy to control and simple to adjust. 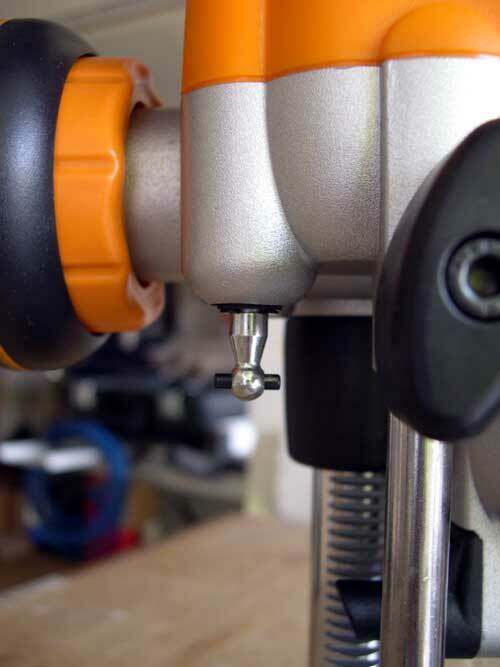 The variable speeds should handle a wide range and variety of bits and the soft start, although now a common feature, is a real bonus for hand-held working. 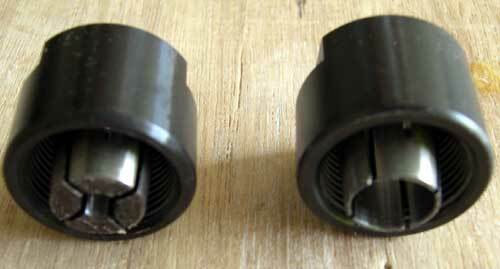 The guide bush system does not use the full metal baseplate attachment of the larger model. 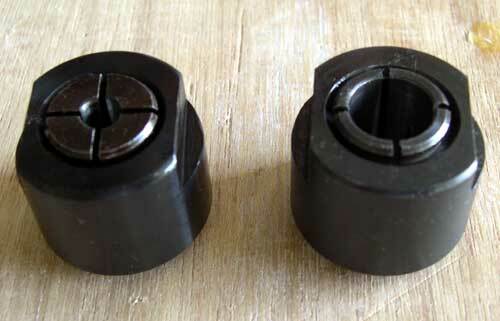 Instead, it has two lugs in the underside of the standard baseplate, which locate the guide bush carrier plate. This, in itself, needs a more substantial baseplate, which is why the MOF001 has a much thicker version than the larger machine. Because of the scallop for the above-table winder and the holes for the extended baseplate attachment knobs, re-fitting the baseplate is impossible to get wrong (it also has locating ribs moulded into the underside). If used in a table with guide bushing, a spacing ring is provided - the reason for the length of the supplied M4 screws. Retaining all of the safety features of its stablemate, the new 1400W machine combines a user-friendly hand-held router with the best under-table features available. 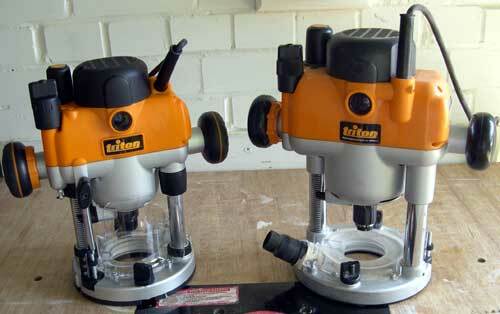 For mid-range tasks, including worktop joints and panel-raising, it is very effective. It is not intended to replace the more powerful model (the 3¼HP TRB001), which continues in production. 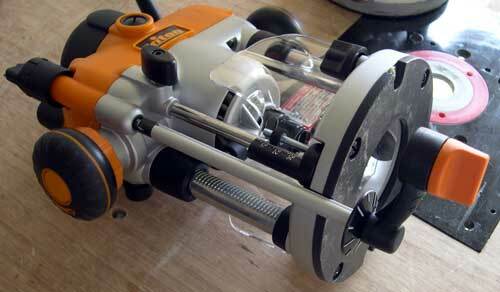 This is a beautifully-made and well-thought-out tool, that I have no hesitation in recommending. No matter how familiar you are with routers and routing, both Triton models have features that are unique, so a thorough read of the instruction manual is an essential first step! 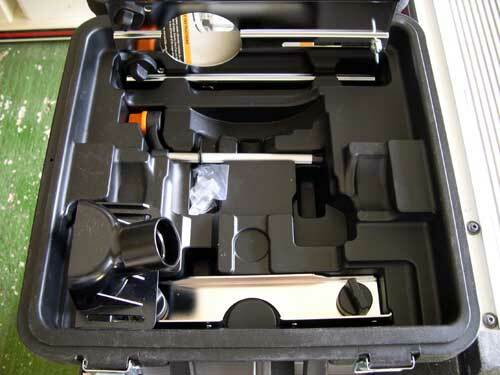 It should be pointed out that the carry-case and kit of parts and accessories, as shown in this review, may not be available as a package in other countries. Update: This router was awarded both "Best Features" and "Best Value" in Fine Woodworking Magazine's test of routers for use in router tables (Edition 189, January, 2007). The other routers tested were Bosch 1617EVS, Craftsman 1617-12, Freud FT1700VCE, Milwaukee 5625-29, Porter-Cable 891 and Ridgid R2900. All pictures taken by author with Nikon CoolPix 4300.